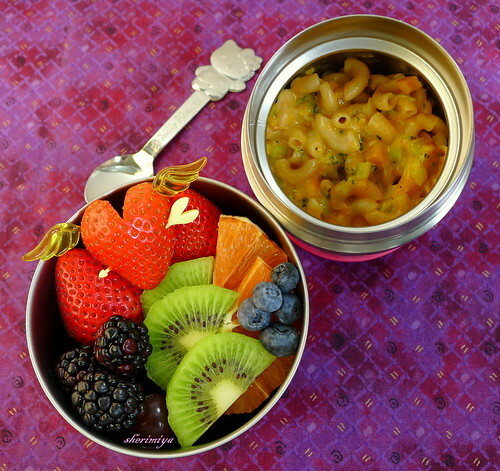 Mac and Ka-broc-cheese-rizo Bento, a photo by sherimiya ♥ on Flickr. My kids have been requesting mac and cheese, so I decided to make a giant batch to last them a couple days. They can seriously put away this stuff. As usual, I packed the portions in their thermal food jars; this one is TinySprite's Hello Kitty Thermos brand jar, which holds 10 ounces and has served us well throughout most of her preschool lunch career. I know it doesn't keep the food as hot as long as MisterMan's Stanley food jar, because I've done a nonscientific, side-by-side comparison using hot water and a thermometer. It doesn't really matter for her since she eats within 3 hours or so after I've packed it, but my bigger concern now is that she may be outgrowing this little jar. The last few times I used it, it's come home completely empty -- which is good, of course -- but it just makes me wonder if I could pack a little bit more for her whether she'd eat more. Cook 8oz (or more if you like) whole wheat elbow macaroni, 10-12 minutes or until just al dente. Drain. Steam or microwave 5 slices kabocha (or more) and one head of broccoli until softened. Whisk: 1C milk, 2T whole wheat flour, 1tsp dry mustard, and a sprinkle of cayenne pepper. Cook over medium heat, stirring constantly, 6-8 minutes. Add the diced kabocha and broccoli. Add a half link (or more, if you like) soyrizo. Stir it all in well. Add: 1C (or 2C, or more) shredded cheddar, parmesan, or whatever cheese you happen to like. Stir. Added to Allergy-Free Lunchbox Love. I´ve tried to make mac´n cheese a couple of times here but for some reason my girls won´t eat it eagerly :/. Maybe I don't know how to make a proper one :) , will definitely try your recipe! I like this mac and cheese has "Ka-Broc" in it. I'm going to make the same way!! More nutritious and I think it's yummy (maybe true mac and cheese lover may not like any other ingredients besides cheese and pasta? I LOVE this idea though!). Thank you for doing non-scientific test about the bento box. I need to find something like that soon. I hope your kids like it; I feel so good about them eating it because it's a one-dish pretty well balanced meal in itself, and then I just have to pack fruit besides. Great title :o) And as for the mac&cheese, I would have thought that broccoli would have been a bigger issue the squash, which is usually sweeter and therefore more likeable. The bento look delicous anyway. Maybe you could try packing TinySprite a bigger bento. If she comes home with an empty box, you'll know that she's up for a bigger portion. She's growing up and needs the energy anyway, especially now with her elbow. How's that coming along? Still in high spirits? Actually, my boy says that broccoli is his favorite vegetable, so that one's not a problem. Maybe it's the texture of the squash; not sure. I'm going to find a bigger thermal for TS. This meal provides a lot of calcium for her healing bones and I imagine them getting stronger every day. She's almost back to her normal kind of activity; you'd be surprised how much she can still do with only one arm! Thanks Ceinwyn! OK, I think it's official... I need to come eat at your house! Who can resist mac'n cheese? I love the little winged heart :) Makes min go all a'flutter. You're officially invited Heather! Thanks! Kudos to you for getting all those veggies in the Mac n cheese! The fruit looks scrumptious as always and I love the cupid strawberry :D I'm totally impressed that your kids will eat warm food for lunch. A-chan won't even consider eating something until it's all cooled off, which drives me nuts! I'm pretty psyched about this batch; will definitely make it again this winter. Kids all have their own quirks - if A-chan likes cold food, so much easier for you! Thanks Natakiya! I just found your blog (searching for a taiyaki recipe) and I am stoked! I want to start making bento lunches for my 2 kids and your blog seems like the perfect place to start. Thanks! So glad you found me too hiraganamama! I hope you find ideas to get you started with bento for your kids. It's a lot of fun and very satisfying once you see how well your kids will begin eating at school. Thank you! You inspire me all the time:)Thx. The strawberry heart is so cute. That's so sweet, making baking and creating; I really appreciate that! OMG, this mac n cheese is calling my name! Looks so good. Not sure if I can get the green 'flecks' passed by my K's eagle eyes. lol. I could try.. oh yummy! Oh, you should try! Try try try! !